Do you life your life blissfully? 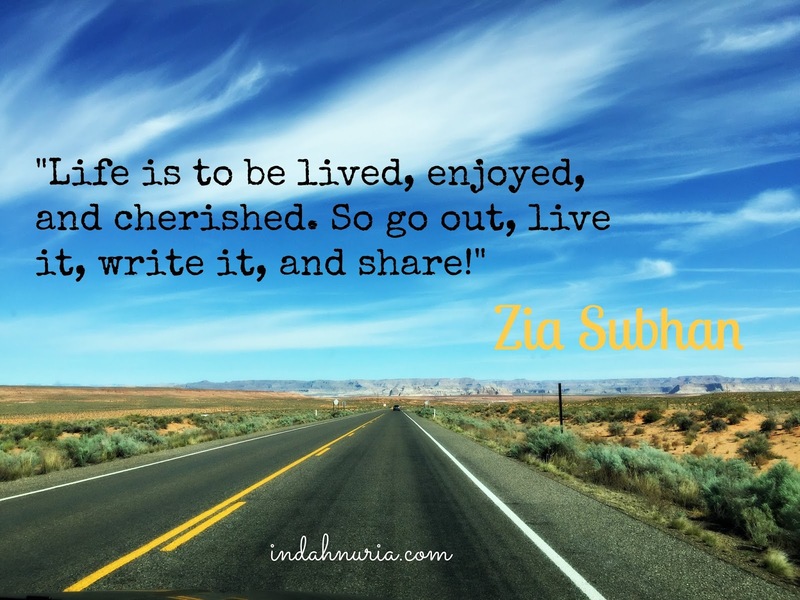 Have you taken some moments to capture the magic of life and immortalize it in your mind, then share it through your writing? Well, I started doing it recently through my blogs and more. I know life doesn't always bring you rainbow, it brings you lemons, too. But embracing everything God bestows us will give you peace. Those moments, its up and down, should be cherished. And writing about it brings you solace. Another treasure I cherish in life is friends. Friendships indeed sweeten our lives and open so many beautiful doors of great moments, opportunities and better lives. When they say the more, the merrier, I can't agree more. I am so happy to meet all new bloggers through my circle of arisan. Then let me introduce you to Zia. 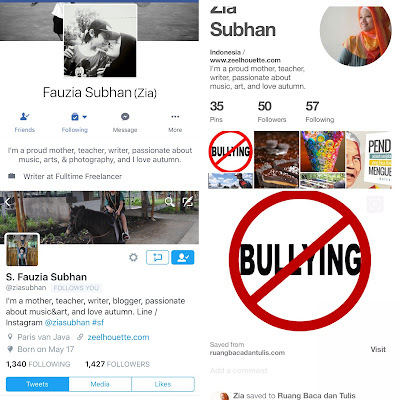 S. Fauzia Subhan is her complete name. As you see here, she's a mother, teacher, writer and blogger. Quite a compilation of profession indeed. Being a wonderful mom, Zia has proved how versatile a woman can be. 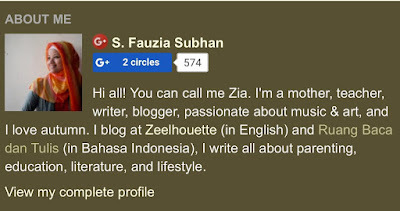 Multitalented, cheerful, and active, those are some of the qualities that I know for sure Zia has. 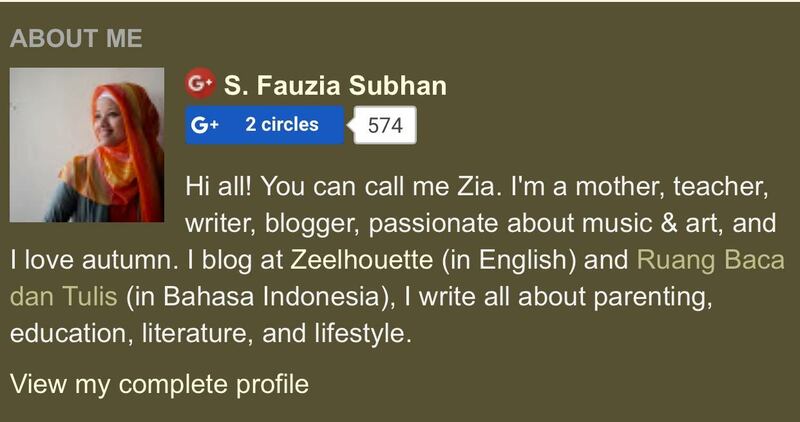 What strikes me first while browsing along her blogs is her tagline. Exactly...the one that I quoted in my picture above. "Life is to be lived, enjoyed, and cherished. 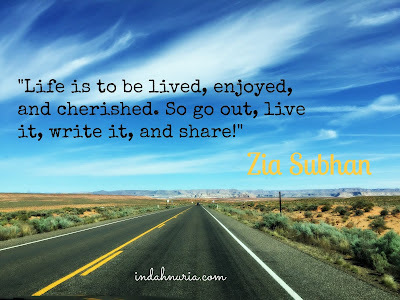 So go out, live it, write it, and share!" It hits me right in the head and makes me think and rethink about my blessed life. Have I lived it to the fullest? Have I shared the happiness I feel? It intrigues me and it makes my browse her blog for more insights. I guess she started blogging in 2012, as I peeped on her archive. In the beginning, Zia wrote a lot about educational world in Indonesia, including some scientific essay about child's development. Well, as a teacher, those prepositions given were pretty much valid. Zia certainly wrote a lot about education and her sweet relationships with her kids. Sharing a few fantastic tips about how to cherish your life with your beloved kids, including in teaching them about the sanctity of the Holy Month of Ramadhan. And how to find your happiness! I am always touched to read her posts about family. Really warms my heart. And of course, the roller-coaster life of a mom, with daily handy tips tutorials on wearing hijab, for example, as well beautiful places to visit in Indonesia and many more. And apparently, we share the same passion for photography. I also enjoy her photos. Judging from those, She is a talented photographer. Her B&W collection is truly enjoyable, with some precious moments beautifully captured through her lenses. Psst, I also found some beautiful poems written by her :). Wanna know more about it? Go check it out yourself on her blog. And last but not least, we both love autumn. I have been smitten by the beauty of nature when the leaves turn golden and red, when the wind gently blow them to the ground. Aaah..how I love autumn. And so does Zia. I guess that's why her blog is pretty much dominated by the autumn leaves. See, there will always be beautiful things you learn from another. And this is what I cherished from having new friend. Jadi ingat lagu Kool and the Gank ..
Wah okeh juga ya mbak, okeh deh terima kasih untuk infonya.. I love to make new blog friends too! It sounds like you and Zia have a lot in common. I am sure you will be the best of blog buddies! She's definitely one of the best blog buddies ever. The first time I knew her, she's a really kind lady. Nice to meet you here, Theresa.